H S Prannoy outwitted World No 2 and title favourite Kidambi Srikanth in a thrilling finale to claim the men's singles title at the 82nd Senior National Championship, in Nagpur on Wednesday. H S Prannoy outwitted World No 2 and title favourite Kidambi Srikanth in a thrilling finale to claim the men’s singles title at the 82nd Senior National Championship, in Nagpur on Wednesday. Second seed Prannoy, who achieved his career-best ranking of World No 11 last week, saw off top seed Srikanth 21-15 16-21 21-7 in a 49-minute clash to return the favour after his semifinal loss to his compatriot at the French Open Super Series last month. Satwik Sai Raj R and Ashwini Ponnappa, who decided to pair up just six months back, showed their prowess by beating top seed and World No 16 Pranaav Jerry Chopra and N Sikki Reddy 21-9 20-22 21-17 to clinch the mixed doubles crown. Excitement soar high once Srikanth and Prannoy made it to the finals and the match turned out to be an exhilarating one as the duo displayed their repertoire of strokes and athleticism during the fast-paced rallies during the match. Srikanth and Prannoy have played four times in their international career but it was the former who had the last laugh on the last three occasions. The only time Prannoy had beaten Srikanth was way back at the 2011 Tata Open. Srikanth has been in the form of his life as he clinched four titles after reaching five finals this season but all the statistics didn’t matter as Prannoy showed why his wins over Lee Chong Wei and Chen Long this season were no fluke. In the opening game, Srikanth rode on the series of unforced errors from Prannoy, who struggled to keep the shuttle inside the court early on. His errors gave Srikanth a 4-1 cushion. The Kerala shuttle slowly got into the groove and engaged Srikanth in parallel game and produced some precise smashes to claw back at 7-7. The duo moved together till 10-10 before Prannoy netted a return to give a slender lead to Srikanth at the break. The 25-year-old from Thiruvananthapuram continued his good run after the interval, showing better anticipation and better court coverage to eke out a 14-12 lead which he quickly extended to 20-14 when Srikanth miscued a stroke. Prannoy squandered a game point before unleashing a precise backhand return to grab the opening game. After the change of sides, Prannoy opened up a 2-0 lead and soon moved to a 7-3 advantage when Srikanth made a judgement error on the baseline. However, Srikanth recovered with some angled returns and made it 8-8 when Prannoy rushed into a shot and found the net. Srikanth produced a cross court smash which a diving Prannoy failed to retrieve. The Kerala shuttler then went wide to again hand over a 11-10 lead to academy mate. The Guntur shuttler continued to gather points with his ability to be patient and create gaps. He lead 17-15 before Prannoy again committed few errors to allow his opponent move to a 19-16 lead. Srikanth came up with a down the line smash and then Prannoy again found the net as the world no 2 roared back into the contest. 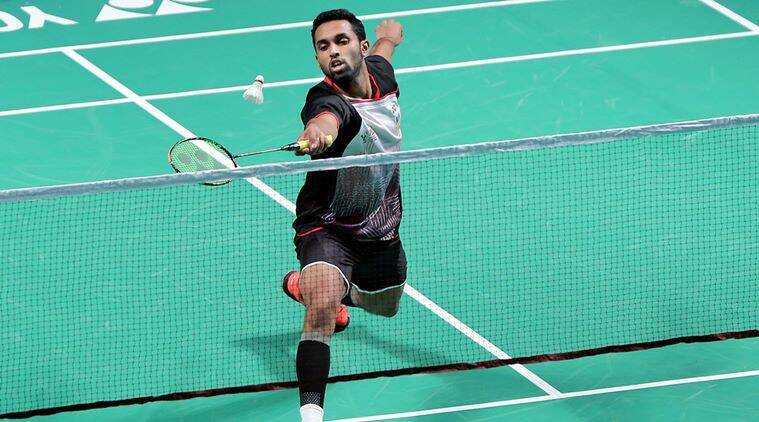 In the decider, Prannoy engaged Srikanth in fast paced rallies, making his opponent twist and turn across the court. His ploy worked as he took a 6-1 lead. Credit to Srikanth, he kept hitting the shuttle back most of time but Prannoy ensured he had a healthy 11-3 lead at the interval. After the break, Prannoy continued to dominate the proceedings, producing some steep acute-angled strokes and net dribbles to lead 16-4. Prannoy faltered with a low return and then hit long but next he put the shuttle away from Srikanth’s outstretched arms to lead 17-6. The World No 2 continued to struggle with his rhythm. One of his backhand return going to net gave the match point to Prannoy, who squandered one after finding the net. However, Prannoy grabbed the next point when Srikanth faltered at the net.